We Hoosiers face some pretty intense weather. Living in an area ripe with severe weather doesn’t always bode well for trees, but we’d like to share with you some tips on how take preventative measures before a storm occurs and how to access the damage of the trees after the storm is through. If there is minimal damage and remaining structural integrity of a tree, then the tree has a good chance of surviving. If there is heavy damage to the trunk or the root structure of the tree, the tree has lost a significant amount of its structural integrity and should be removed for safety reasons. Don’t jump to conclusions when losing foliage, as strong wind gusts can wreak havoc on the leaf coverage of your trees As long as the trees don’t have heavy structural damage, then there is no need to replace it. While nothing you do is going to stop a Tornado of adequate power, there are steps you can take to lessen future storm damage. First, keep your tree healthy and the growth vigorous. Watering, fertilizing, and protecting trees from soil compaction are a few ways to maintain a tree’s health. Prune out the dead and weakened limbs of your trees annually and thin excess branches out of the crown to reduce the sail effect on the canopy. Also, make sure to plant the right trees in the right spots. You wouldn’t want to plant a large, brittle tree right by your front door. Factors to consider when determining if a tree is worth saving: Species Age Growing Location Value it adds to the property Sentimental value If a tree is not worth saving, remove it as soon as possible. If it is not removed and the tree dies, it could become hazardous, and not to mention, more expensive to remove. 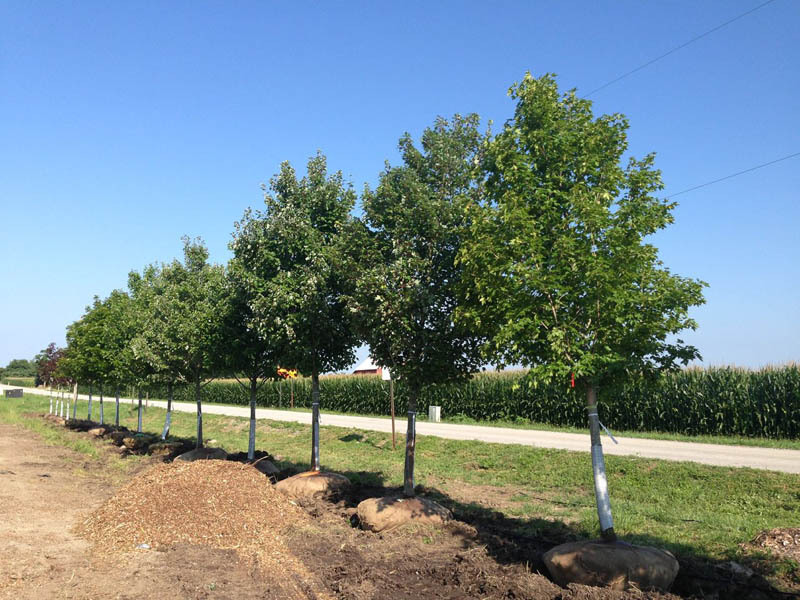 Beyond the initial installation and initial staking process (if requested), it is up to the customer and/or homeowner to properly care for their tree/s. It’s unfortunate when it happens, but in cases of extreme weather, Hoosier Home and Garden cannot be held liable. If you’d like further information, our entire staking policy can be found here.